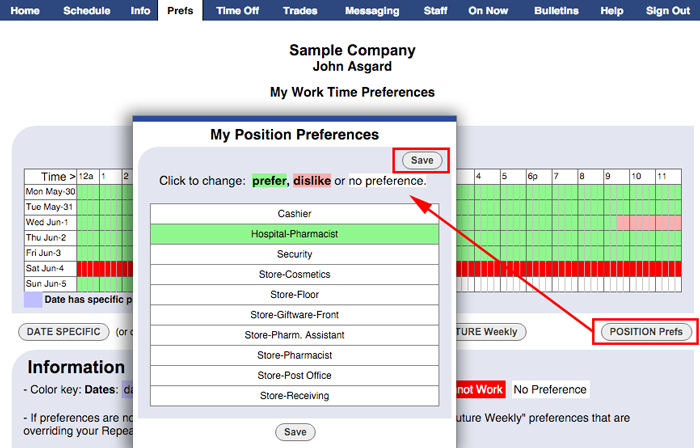 If your manager lets workers set Positions/Locations, you will see a POSITION Prefs button on your Prefs page. You can click the Position/Location to change the color and set whether you like or dislike each position. Make sure to click the Save button. Setting these preferences does not guarantee your scheduling manager will follow them, but you may be more likely to get the most favorable schedule possible by entering these preferences.